React is a UI library to create interactive and reusable UI components. It is considered as the V in MVC. It allows you to create your own components (NOT Templates like in AngularJS) that you can later reuse, combine, and nest to your content. Thus it will boost your productivity. React.js is based on a concept called the Virtual DOM that determines what changes need to be made in the DOM beforehand and updates the DOM tree accordingly. Thus it avoids costly DOM operations and makes updates in a very efficient manner. Check out Instagram for an example of a fully React based application. It will add react library references in the project. 4. Add MVC5 Empty Controller (HomeController.cs), Add View of Index method without Model. // Automatically generated by ReactJS.NET. Do not edit, your changes will be overridden. componentDidMount is a method called automatically by React when a component is rendered. The key to dynamic updates is the call to this.setState(). We replace the old data with the new one from the server and the UI automatically updates itself. When the state is updated, the component re-renders itself. 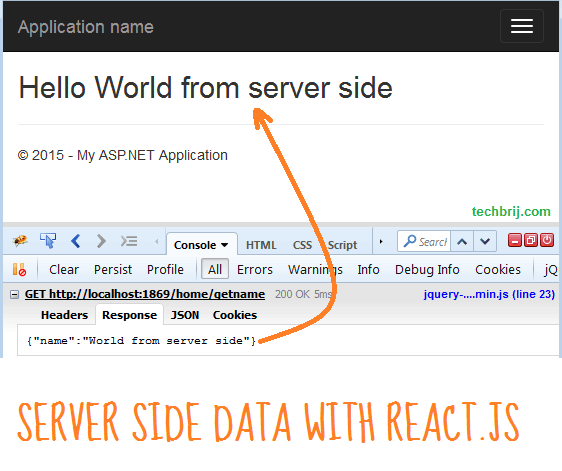 In next post, we will do something interesting with React.js. Stay tuned and Enjoy React !! Thanks for the POSTing , right now i am searching asp.net core + React Js CRUD sample ,if you have the idea can you share with us ?